What do you do when you visit some place for first time and you see some great light before you reach there? 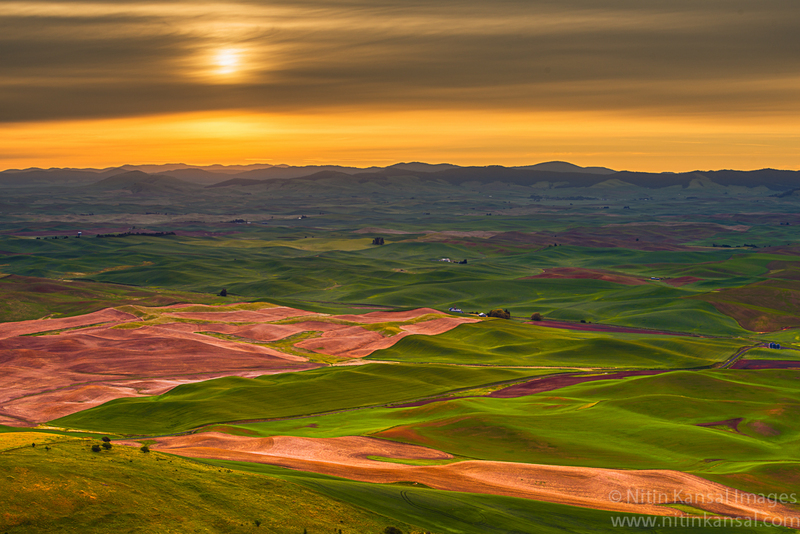 I had similar experience during my steptoe butte photo shoot. I left from hotel with friends at 4:00 and by the time we reach bottom of the butte we saw some nice colors. My heart started beating faster and i was thinking will i make it to top of butte to catch sunlight? Answer was NO. We reached around 10 mins late and sun was already over horizon! But, Mother Nature had better plans for us.After 30 minutes of nice light, Sun was covered in dense clouds. I could barely see it but colors were more vibrant than at sunrise and i suddenly see some light in sky and i think it was sun. I grabbed my camera and set my tripod and started taking pictures. Above picture is one of those beautiful moment which i captured at that time..
How this picture was made? I used Nikon D800, Nikon 70-200 F2.8. at 70mm, ISO 100, F9.0 and 1/15 sec. It’s a hand blend of 2 shots. One for the Sky and one for the foreground as i didn’t have GND Filter. After manual blend in Photoshop CS6, imported in Lightroom. Minor Curve and local adjustment in Lightroom and exported for web. Beautiful colours! Please add date for when taken. Thank you for your email! Thanks Michael! I didn't realize date is not turned on here!